Nifty little RM9 2 stroke in that golden sand colour. Non-runner at the moment but I have new fuel line, new plug, HT lead and plug cap to go with. Single seat model, looks to be 99.999999% all there but will need a headlamp mounted headlamp switch. Single seat cover has seen better days. Otherwise all decent. I've made in roads regarding cleaning it up but in all honesty I won't get much farther than that. I'll never ride it, I just got it as it looked fun. Nifty little flick switch that enables the little 'ped to be pedalled like an ordinary bike. No V5C. Tyres are round and black, they hold air but no idea as to how old they are. Lots of spares and know how available. Lovely project in all honesty. I just want back what it owes me, so shitters price is £195.00. Location: Edmonton. Interesting. Is the Ultramatic the one with the single variator and the engine which swings back as the gear ratio increases? 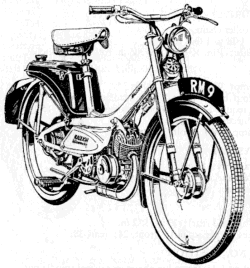 Similar to RM8 but with automatic variable speed transmission. Fire Red & Pearl Grey. November 1965 Golden Sand. February 1968 Calypso Coffee & Pearl Grey (offered for a few months only), or Royal Carmine (single colour). 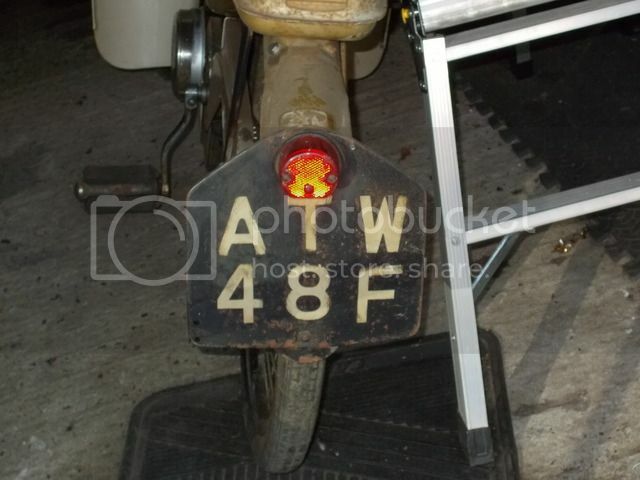 Ken - as the resident moped Womble Im interested - any photos of it as is now? I'd buy it but prefer the ones with elastic band front suspension. Ooh, can’t wait to see pictures. Piccies will happen maybe even later today.If I can get into the garage. 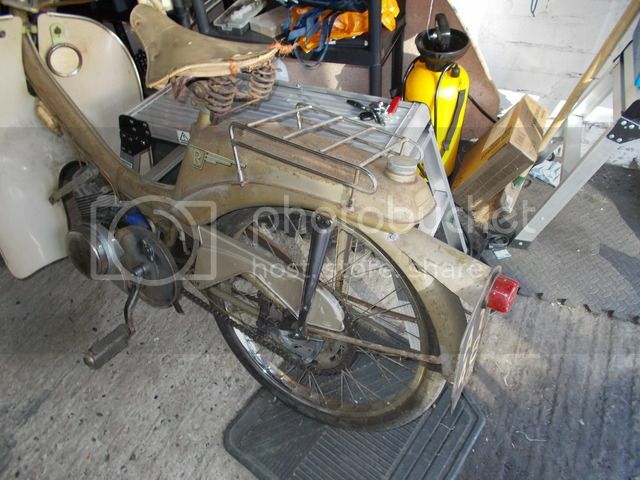 Ghosty, as mentioned it's essentially a Moby engine so 49cc I thinks. Apparently the colour is "Polychromatic Golden Sand" and dates it to post-66! My first field bike when i was just 11 was Raleigh Runabout followed by a rigid framed Puch Maxi. I am also keen to take it on and tinker with it up the shed during the winter. I am glad there is other interest, as I think they look great and wanted it a worrying amount! Every garage should have one! Okay Ped Pervs, piccies as promised. There has been a fair bit of interested PM'ing about this, knew I should have doubled the price lol. If multiple people do want it I will do the honourable thing and go by time of PM's, or toss of a coin, whatevs. It just gets better, that is lovely. F*ck me vicar, that is absolutely magic. Love it. Have no need for it and I'd need to do CBT, also riding Six-cylinder's field moped terrified me, so I've no clue why I'm so drawn to it. I'm about to spend £stupid on a stainless exhaust for the GTi, so I probably shouldn't double my expenses. It's a charming little thing, I bought it on a whim and don't regret it at all actually. It was only 10 minutes away from home and it mostly fitted in the i10. As long as I can cover the purchase price and bits thus far then I'm happy. Folk have been ace to me on here and I'd never take the mickey on price to the folk on this forum. If I had more little peds then I could make all of you happy. 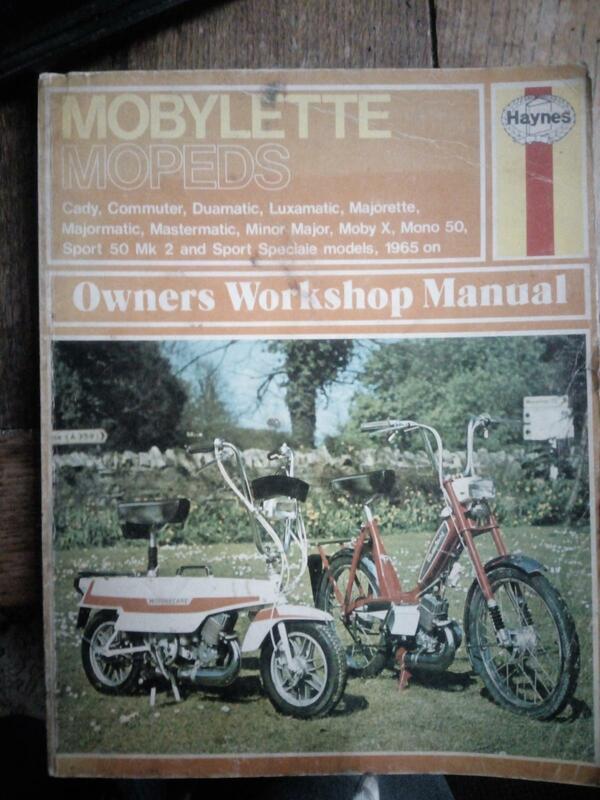 Also have a repro owners handbook for it. There is a sort of Manuel. I don't have a HBOL, but I have been playing with Mobylettes for 25 years so I like to kid myself that I have a vague idea how they work . Presumably if it mostly fitted into an i10 it would completely fit into a 75 Tourer? 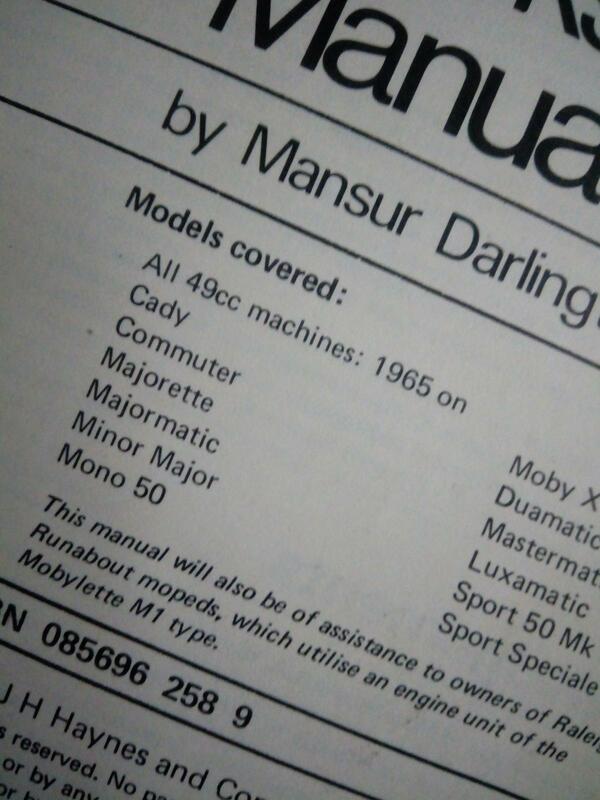 I know my current Mobylette fitted quite easily into my dad's 240 estate but the Rover isn't quite as capacious as the old Ovlov. 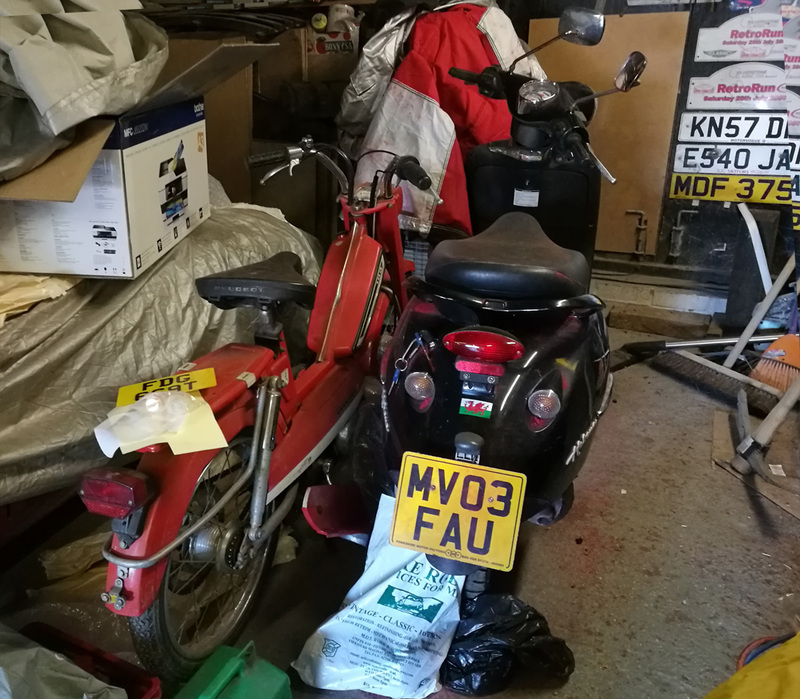 Should be fine mate, the i10 accepted 97% of moped. Welcome to have a fiddle round with it here before you lob it in the back of the 75. Can you please add me as 4th in line, this looks amazing!